According to the press freedom organization Reporters Without Borders, the Philippines is one of the world’s most dangerous countries for the media, lead in number of killings against journalists only by Iraq. During his election campaign, President Benigno Aquino made commitments to press freedom under his presidency and also promised an end to impunity in the country. However, according to inside sources, little effort has been made into resolving the cases of journalists murdered this year. Media workers are not only targeted by the government; journalists also face difficulty in accessing information, periodic self-censorship, and low pay. Sampsonia Way interviewed Filipino reporter/photojournalist, Raymund Villanueva to understand the challenges journalists face while working in one of the world’s most dangerous countries. Villanueva is a director of Kodao Productions and CERV-Philippines a multi-media production group, and is a founder/director of CERV Philippine, a volunteer placement organization that works with volunteers from six continents in the areas of health, education, and the environment. In the interview, Villanueva describes the current situation for journalists in the Philippines, explains what precautions journalists are taking to do their work safely, and describes what he calls the “tragic” state of democracy in his country. As a journalist have you been at risk in the Philippines? What precautions do you need to take to do your work? Have you censored yourself? The Philippines has been described as the most dangerous country for journalists. Under the 15-month-old government five journalists have been killed. The November 23, 2009 Ampatuan Massacre is the bloodiest attack against journalists, where 33 were killed. There is an acknowledged culture of impunity in the Philippines that targets journalists, among others. I have also covered gunfights between rival political clans. As for precautions, I have attended safety workshops given by media institutions and groups. And I always work with trusted persons and organizations. I can not say I have censored myself. Some of the stories I submitted that failed to see print were the decisions of my editors and superiors. According to Reporters without Borders paramilitary groups and privately-owned militias have been implicated in most of the attacks on journalists since democracy was restored in 1986. In 2011 these groups were listed as Predators of Press Freedom. Could you describe the situation and how journalists deal with it? In almost all extra-judicial killings where journalists are the victims, the Philippine military, their paramilitary groups, the police, and powerful politicians are always the suspected perpetrators. The statement is correct from where I stand. 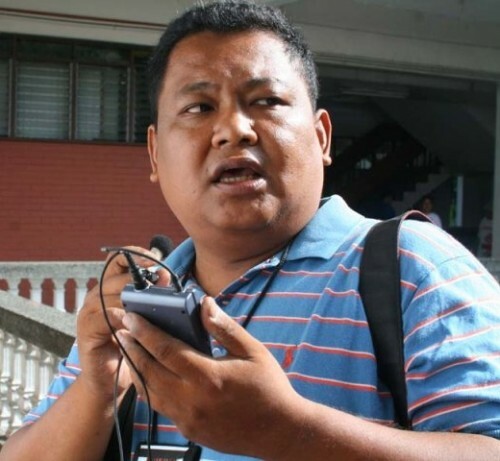 Media groups have intensified their campaigns against this culture of impunity and have instituted safety and support programs for journalists and their families. Journalists have bonded, and are more united than ever, as a direct response to the continuing threat. Have you written about this issue? Yes, numerous times. Only through an informed public can the people be engaged to condemn the attacks against journalists as an attack on their communication and other democratic rights. I have also authored and presented resolutions that were approved by international conferences of media organizations. We are asking for the support and solidarity of media groups abroad and the international community. President Benigno Aquino made commitments to freedom of the press and the protection of media workers in 2010 but, within four months, between July-October 2011, two radio announcers were shot and killed, a local newspaper editor was shot, and another radio announcer received death threats. How is the government related to these cases? How difficult is to cover these cases as a journalist? In most media killings under the Aquino administration, either elected officials or the coercive agents of the state are involved as suspected perpetrators. As journalists we think this government is foot-dragging, or is not really serious in ending the culture of impunity. As a presidential candidate, Aquino also promised to pass the Freedom of Information Bill. He has since withdrawn support to the pending bills in Congress, saying it may open the government to abuse from the media. Covering such cases is emotionally difficult because some of the victims are acquaintances, but we just do it. How would you compare the dangerous situation for journalists in the Philippines to other Asian countries where journalists face serious risks? We think ours is more tragic, because our government has prided in its so-called restoration of democracy since 1986. Also, there are more journalists killed in this country than in any other country, not just in Asia, but the world. I found that since 1992, 72 journalists have been killed in the Philippines. After Iraq –where 151 journalists were killed—the Philippines is second in the list of killed journalists on Committee to Protect Journalists . What are the main differences and similarities between the Iraqi and the Filipino policies on freedom of speech? The glaring difference between Iraq and the Philippines is that the former has suffered two wars of aggression from Western powers and that the Philippines is posturing to be a democratic country. Other than the killings of so many journalists in both countries, I don’t see any similarity. How would you describe Internet policies and practices in your country? There is no comprehensive legislation regarding internet polices and practices in this country. Some offenses such as hacking and spreading pornographic content are considered crimes. The internet may be considered comparatively free, but it is also open to abuse. Could you share an anecdote on Internet abuse against yourself or one of your colleagues? How does the internet censorship affect journalism? There have been several attempts to hack or bring down alternative news sites such as Kodao.org, Bulatlat.com, and PinoyWeekly.org. In addition, we have received connection requests from fake social networking accounts that later try to discredit us in other online forums (trolls). We have since undertaken online protection training. 2 Comments on "Raymund Villanueva: Reporting from the Philippines, One of the Most Dangerous Countries for Journalists"
sa pag lalahad nang katutuhanan natural lang na may masaktan, especially, kung eto ay totoo. . . . bunga nang galit silay naging marahas. . . hindi nila tangap na kung ano silang uri na tao. . . . .